First off, an apology for not being here with you these last few months, however, every now and then a hiatus it in order. Regardless of the reasons I’m here now with a new sample provided to me by the Austrian wine contingent. A new wine for me to be sure, but not a new varietal. A 2009 Grauburgunder Steirische Klassik from Neumeister. 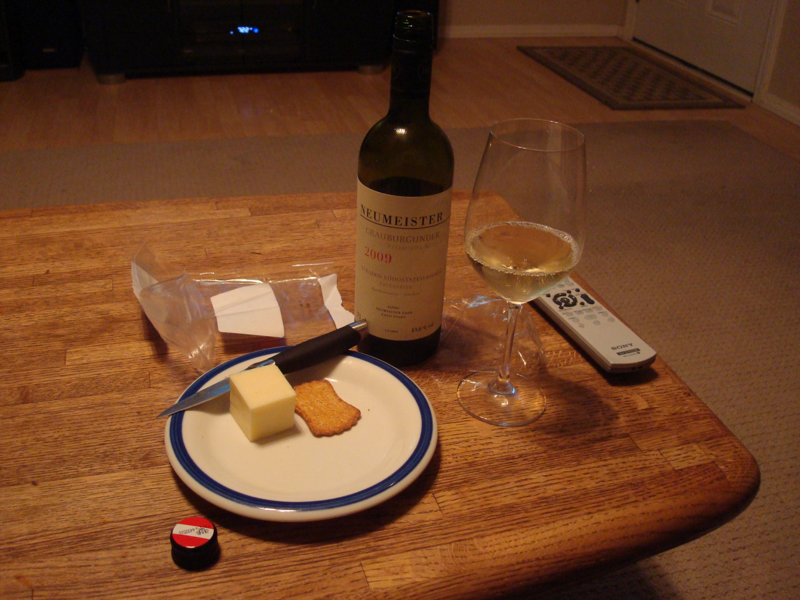 This wine is made from an Austrian Pinot Grigio and has been a decent companion to my post Financial Statement Analysis MBA course, paired up with some Sonoma Jack cheese and crackers. This is a nice light wine that has some Sauv Blanc / Fume Blanc characteristics and is a very easy drinking wine. Easy to open (with it’s screw cap) and easy on the palate. Nothing too complex here. The wine was finished in some oak and there is definitely some wood on the nose. The body of this light wine has a touch more body than that of a stainless-only white. It’s nice to be back, I’m hoping to get back into a more regular schedule of postings, I look forward to hearing from you. Pumpkin Pie, Round 2… on Yeah, I want pie!